Can you count cards playing Baccarat? Every day, hundreds of online Blackjack players descend on Palace of Chance to practice their Blackjack card counting skills. We don’t blame them. Sure, it’s not easy to count cards online, but it’s a great place to hone your skills for the real world. But while Blackjack tends to steal the card counting spotlight, there’s another table game that people are flocking to in droves. We’re talking about Baccarat, arguably one of the most popular games at Palace of Chance. That’s not much of a surprise, considering that Palace of Chance mirrors the real world. And in the real world, Baccarat has overtaken Blackjack as the most popular casino game, attracting some of the biggest whales to the tables. And due to its increasing popularity, casino players all over the world want to know if it’s possible to count cards playing Baccarat. Today, we dig deep to bring you the answers. We’re going to assume that you’re not new to playing Baccarat. You know the basics of the game. You know how to place your bets. You know what it takes to win. 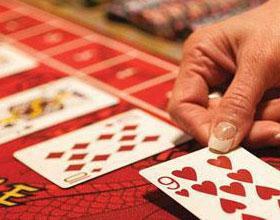 If you’re new to Baccarat, read one of our quick tutorials to get a feel for the game first. 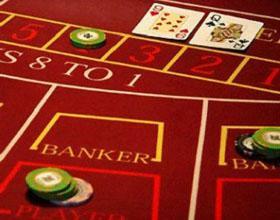 As you know, there are two betting possibilities in Baccarat. You can either bet on the Banker or you can bet on the Player. The Player bet comes with a house edge of around 1.24% while the Banker bet comes with a lower house edge — somewhere around 1.06%. To refresh your memory, when you win on a Banker bet, the house takes a 5% commission, which is how the house accommodates the lower edge. With that in mind, most people assume that the two bets are pretty much the same at the end of day, at least in terms of profit margins. But when you card count, you can figure out which bet to place. 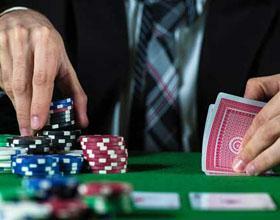 The main idea here is that by card counting, you’ll know where to sway your bet. As the count increases, you’ll move to the Player bet and as the card decreases, you’ll move to the Banker bet. You need to be at a table with a 6-deck or 8-deck shoe. You need to sit down at a table where the shoe is fresh (no jumping in on a half-played table). Think of it as starting out as if you had some sort of OCD: No jumping on a game that has already begun can become the source of terrible anxiety. You’re playing like Baccarat. You can practice your Baccarat card counting skills online, but you need a shoe that comes to an end. Online, it’s all about the continuous shuffle. Have you met all these requirements? Have you double check? Triple check? Yes? Then it’s time to start counting cards. Start with a count of 0. When an Ace, 2, or 3 hits the felt, add 1 to your count. When a 4 is dealt, add 2 to the count. When a 5, 7, or 8 hit the felt, subtract 1. When a 6 drops, subtract 2. That’s pretty much it. When the count is higher than 16, a Player bet is smarter. When it’s below 16, consider a Banker bet. If you’re the type of player who likes to bet on a tie in Baccarat, you’ll need to rethink how you play. 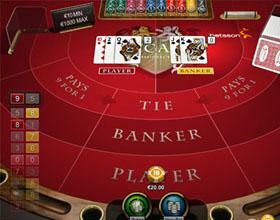 Counting cards in Baccarat involves betting on the Banker or the Player exclusively. There is no opportunity for tie bets and doing so not only messes with your strategy, but it negates the whole reason for counting cards anyway. So toss that thinking out the window. In fact, even if you don’t count cards playing Baccarat, betting on a tie just isn’t worth it. 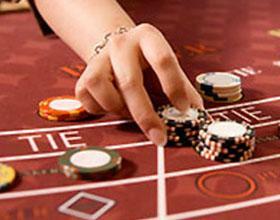 Will Baccarat card counting help you win? Good question. The short answer, yes. The long answer? It’s complicated. While a running count of 16 or below is optimized for a Player bet and a card counting above 16 is optimized for a Banker bet, the real numbers are actually a lot higher. In fact, you’ll need a count of +235 for your Player bet to actually be profitable. And you’ll need a count of -200 for the Banker bet to actually pay off well. 0.00076 units per 100 hands against a bet on the Banker. 0.00095 units per 100 hands against a bet on the Player. 0.00171 units per 100 hands when combining Banker/Player bets. If a casino players wagers $1000 whenever he as the edge and doesn’t place a wager when he doesn’t have an edge, he or she will win about $1.71 per 100 hands. Wow. Sounds horrible. So should you bother with Baccarat card counting? The truth about Baccarat card counting is that while it’s not as advantageous as Blackjack card counting, counting cards can only help you improve your game elsewhere. While practicing your card counting skills at one game, you’ll find your mind becomes sharper and you’ll do a lot better counting cards when it’s time to hit the Blackjack tables. Ready to practice your card counting skills anyway? With a free Palace of Chance account, you can hit the Baccarat tables right now and practice your card counting skills, no matter how futile doing so might be. The best part? You can actually do it for free. We’ve opened up tons of play money Baccarat tables, so you can hone your skills without risking a dime. If you’re now to Palace of Chance, sign up now. It only takes a minute.